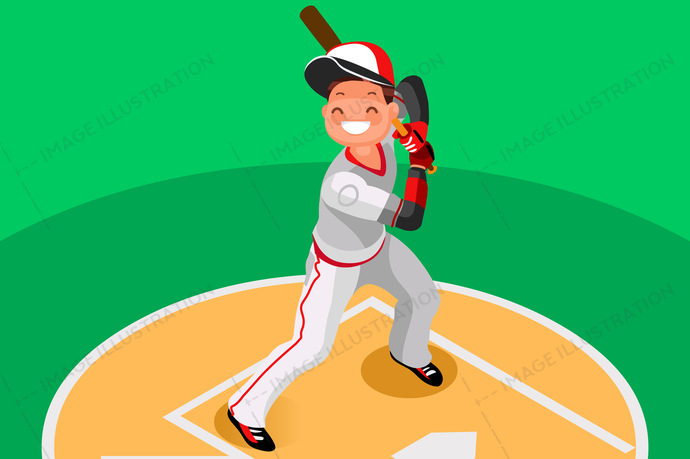 Baseball Vector Boy stock images by Aurielaki. Poster Mascot illustrations in EPS10 EPS JPG AI. Background of baseball with vector mascotte. Sport poster with mlb player. 3d flat isometric people cartoon illustration. SKU: Baseball-Vector-Boy-Mascot-Poster-AurielAki. Categories: Cartoon Sport, Isometric Character. Tags: 3d, backdrop, background, ball, base, baseball, bat, boy, cartoon, cc, champion, championship, character, Clip Art, clipart, college, concept, design, diamond, element, field, flat, games, icon, illustration, illustrator, infographic, isolated, isometric people, logo, male, man, mascot, mlb, people, player, poster, school, silhouette, softball, sport, stadium, swing, symbol, team, usa, vector, wallpaper.